Newport Southbank Bridge, the "Purple People Bridge," connects Pete Rose Way in Cincinnati to Third Street in Newport. At 2,670' or just over a half a mile long, the Purple People Bridge has been redesigned to provide an easy way for people to move between the 2 states. It also links the riverfronts of Ohio and Kentucky in a seamless collection of entertainment, dining, nightlife, festivals, parks, attractions and more that could bring hundreds of thousands to the river's edge. The Purple People Bridge marks the first time in Greater Cincinnati's modern history that a span is dedicated exclusively to pedestrian traffic. It will bring two of the Tristate's most important entities - downtown Cincinnati and Northern Kentucky's river cities - even closer together, officials say. 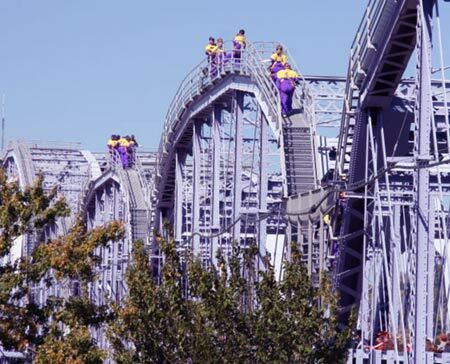 In 2006 The Purple People Bridge climb opened atop the bridge's trusses, an attraction inspired by the Harbour Bridge climb in Sydney, Australia. A major condominium development will break ground in 2007 on the Cincinnati side of the bridge, and streetcars might return to the bridge in the next five years as Phase II of the modern streetcar system currently under study for downtown Cincinnati. The L&N Bridge opened in 1872 as the first Ohio River railroad crossing at Cincinnati. Whereas the Suspension Bridge has stood as a local icon since its 1867 opening, the L&N has stood nearby for just 6 fewer years in obscurity. It is the region's most eccentric bridge, with remnants of a half-dozen major modifications still visible today. Recently in 2002 it was heavily modified once again, painted purple, and reopened in 2003 as a pedestrian-only bridge.